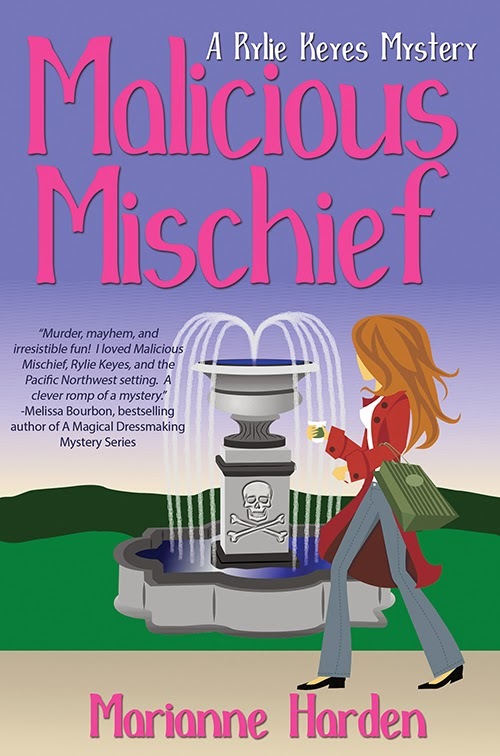 Rylie Keyes, Malicious Mischief’s budding sleuth, is a freckled-faced young woman who wears a smile to hide a wee bit of a frown. I wish I could tell you that Rylie had an idyllic childhood, for she so deserved it. But no childhood can be perfect when soon after your birth your mother runs off and your father is unknown. Rylie, of course, has come to terms with this abandonment over the past twenty-four years but still she wants answers. I will oblige her—slowly—over the course of the Rylie Keyes romantic mystery series. I wonder what she’ll do when she finally discovers the truth. I don’t like to think about it, really. I might make it sudden so she is stunned and a little frightened. I can only imagine her expression. Someone ought to draw a sketch of such a face. I’ll make sure her beloved Granddad is in the room, and near enough to hear her stifled gasp. Certainly, I’ll have to mull over what object has stifled that gasp, her hand, a cloth in the hand of another, or something worse—perhaps. But there’s time; there’s no need to rush. Rylie’s Samoan sidekick Solosolo Namulau’ulu will also be in the room when the truth is revealed, and quietly handsome Zach O’Neil too will be nearby, but Detective Thad Talon won’t be present. Naturally, this will be against his will. Someone is out to harm him, wants to keep him away. I don’t wonder what Talon is thinking, or what he’s going to do. The drop-dead gorgeous have natural tools, especially when accompanied by a charming Scottish accent. And Rylie’s reaction to his absence is also not a mystery to me, and it won’t be to you either, once you meet and fall for her as I have done. I turned, my doubt about solving this case rising. I walked into Detective Talon. I stumbled back, apologizing as he reached out, steadying me with a gentle hand. “Thank you,” I said awkwardly, shocked by the comfort I found in his touch. There came a lengthening silence as he stared down at me. His handsome face folded in, brooding, deep into a frown. “A detective on a power trip, a vulnerable suspect, and an axe to grind—never ye mind, I suspect it’s better if I say no more,” he said, his voice steady but worried. His assertion intrigued me on many levels. Though loosely exercised, it was a breach of the age-old police code of silence. Even when guilty of wrongdoing, cops don’t talk bad about other cops. Puzzled by this man, by how he talked in riddles, I stepped back, clumsily turning on an ankle. He didn’t steady me this time, didn’t touch me. It shamed me how much I had wanted him to. “I find you so confusing,” I said self-conscious, a bit shy. “Don’t risk your career for me,” I said too hastily, too coolly, as one does when skeptical, for police officers carried another burden, the binding pressure of their code of conduct. Is it strange to have the unemployment office on speed dial? Not for twenty-four-year-old college dropout Rylie Keyes. However, her current job at a small retirement home is worlds more important than all her past gigs. Fact is, if she loses this one, she'll fail to stop the forced sale of her grandfather's home, a modest lakeside bungalow that has been in the family for ages. But to keep her job she needs to figure out the truth behind the death of a senior citizen found murdered in her care. Thanks for hosting! I appreciate it so much!